Pretty Good Solitaire has recently updated to version 16.2 with 920 games and improvements for Windows 10. If you have Windows 7, 8, or 10, I highly recommend updating to the latest version. 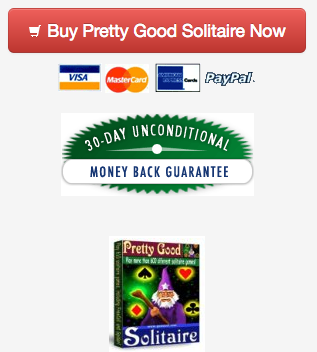 Pretty Good Solitaire Mac Edition recently updated to version 3.3 with 700 games. If you have updated to macOS Sierra, you will need to update our Mac games to a recent version. If you have the full version of one of our Mac games installed (non-Mac App Store versions), just go to the Internet menu, select "Download Latest Version" to update. 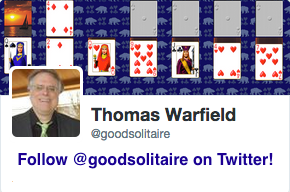 The Mac App Store version of Pretty Good Solitaire has just updated to version 3.3. If you have purchased it through the Mac App Store, go to the App Store, Updates tab to download the update. It's time once again for the Halloween Card Set, a card set with Halloween holiday images on the cards. The Halloween Card Set can be downloaded from http://www.goodsol.com/pgs/halloween.html . Both Windows and Mac versions of the card set are available. This game is at Eternal Triangle.